Celebrate this holiday season by shopping everything you need for your home improvement online. Make a big difference remodeling and decorating your home. We are giving away a Home Depot Gift Card to ten lucky winners for this purpose. Starts Monday, December 12th at 12:00 AM ET to Wednesday, December 14th at 11:59 PM ET. 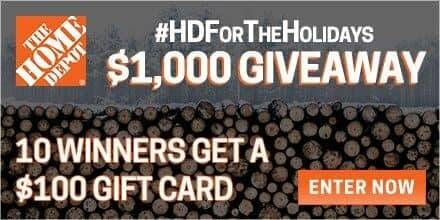 Ten (10) winners will receive a $100 Home Depot gift card. Users enter the giveaway by heading to the Home Depot page and submitting their email address on the form at the top of the page. The winners will be chosen through a lottery drawing and notified on Tuesday (12/20) via the email address they used to enter. Also, check out some of the items from Home Depot that you can gift this holiday season. Disclaimer: Work Money Fun is not responsible for prize fulfillment. Sponsor(s) are responsible for awarding prizes to the winners of Home Depot gift card giveaway.